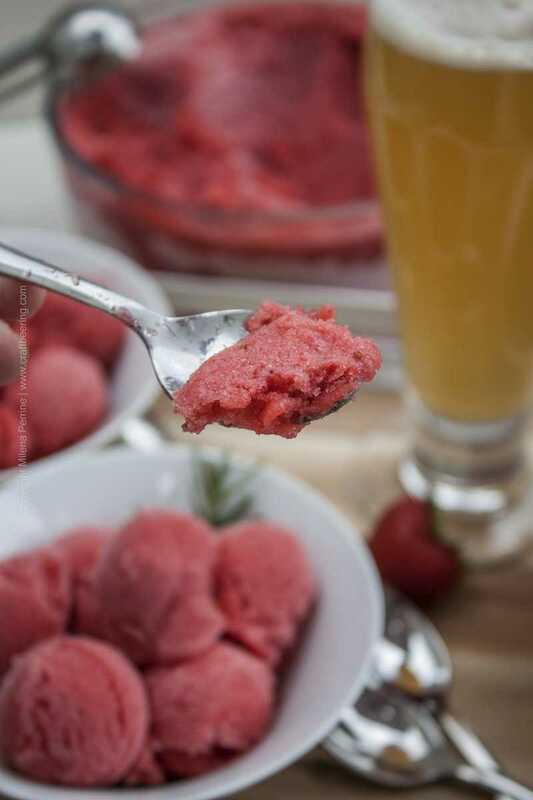 Add the right ale to pureed ripe strawberries and you’ll end up with an ale strawberry sorbet you’ll love and can definitely brag about. Or not – depending on whether you feel like sharing… Sure, there are a few steps besides adding the ale, but they are a breeze to complete, your ice cream maker and freezer will do the heavy lifting. Apparently making a flavorful strawberry beer is not the easiest thing. Chris said that strawberries don’t contribute flavor with the same intensity as other fruit does (peaches, raspberries, cherries are commonly used in craft beer) so extremely large quantities of fruit are required. Additionally, the strawberry flavor was prone to speedily fade away from the fermented brew. And a bunch of other too technical details. I guess that explains why you won’t see commercially brewed strawberry flavored craft beers for sale. 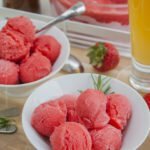 But you can easily leverage the flavor profiles of a variety of ales to infuse pureed strawberries with spice, hints of lemon or orange zest, earthy notes, coriander. Enter ale strawberry sorbet. The flavors of the ale influence the fruit’s basic character ever so slightly, contributing an extra oomph. For example, a Belgian tripel or saison, both bearing fruity esters can give your ale strawberry sorbet a subtle touch of banana or clove. I used an ale that Chris recently brewed and named Summer Blonde. He designed his own recipe, using a basic lager grain bill, added a little bit of wheat, several hops and an ale yeast. The result was a light and crisp beer, slightly hazy like a Heffeweizen and very, very tasty and aromatic. There are both honey and lemon peel in it and it is super easy to drink (we are almost out), which makes it perfect for summer and perfect to use in a sorbet. 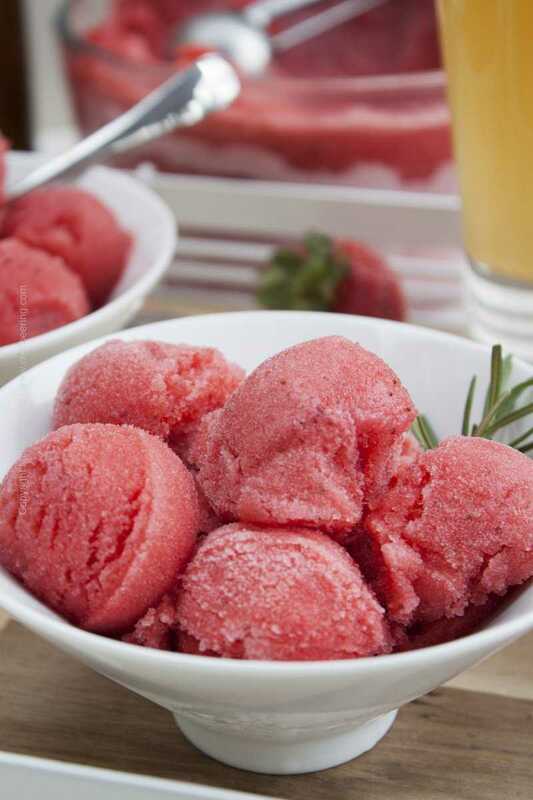 Once served, the color of the ale strawberry sorbet gets deeper and more intense as it sits for a few minutes. So beautiful to watch the transformation of the fine crystals initially covering each scoop to juicy droplets that seep into the scooped mass. 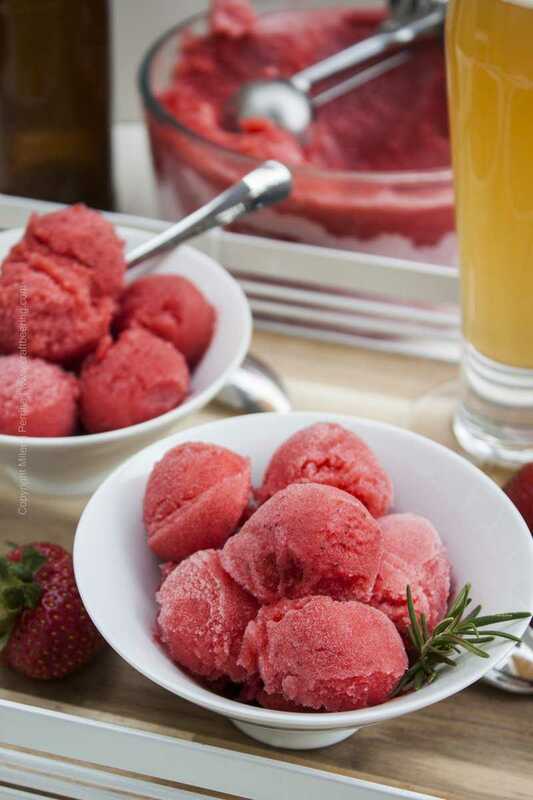 As I mentioned, there are numerous options in terms of what craft beer to select and use for a strawberry sorbet. Here are several styles that will work great, choose your favorite. We own this ice-cream making machine and have been using it without any issues for over seven years. PS. 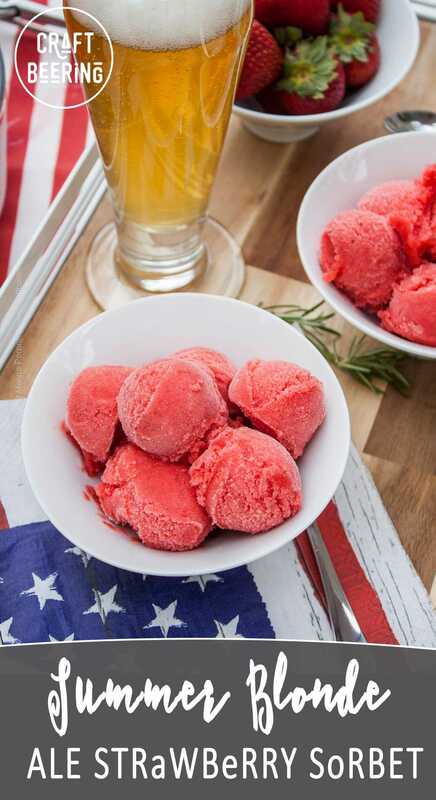 We are serving ale strawberry sorbet for dessert again tomorrow on the 4th of July:) Happy Birthday USA! 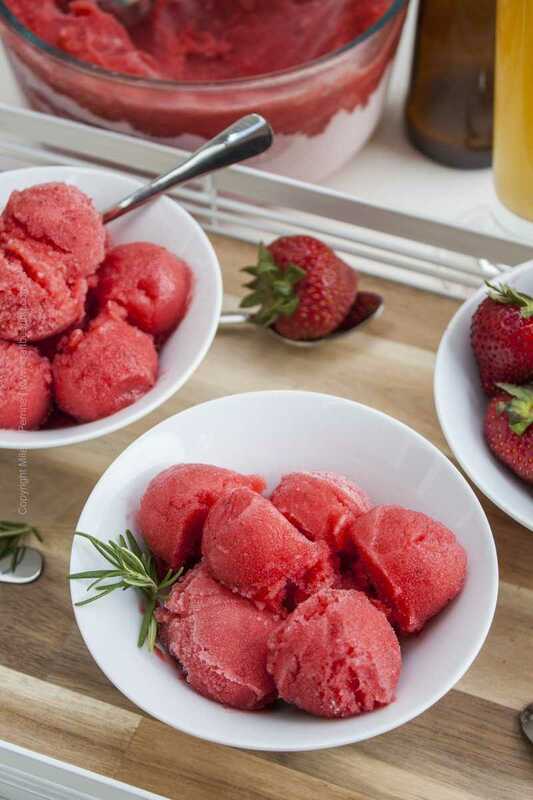 Infuse your strawberry sorbet with subtle spice/herbal flavors by making an ale simple syrup. Use a low bitterness summer blonde ale, saison, Heffeweizen, Belgian wit or Belgian dubbel, tripel or quad. Begin by warming up the ale over medium heat in a small sauce pan. Once warmed through, add the sugar, stir until it dissolves and remove from heat. Let cool off. Meanwhile clean, dry and slice your strawberries in half. Place them in a large bowl and add the cooled beer syrup. Use a hand held immersion blender to puree the strawberries. Strain the puree through a sieve and chill in the fridge for about 1 hour. Following the directions of your ice cream making machine spin the chilled puree until you begin noticing that the texture has firmed up substantially and spot small crystals forming. Transfer to an air tight container with a lid and freeze for at least 6 hours before serving. My hub will love this. It sounds truly delicious and its so pretty. Sounds delicious, pinning ready for the next party we have. This sounds totally killer! It’s the perfect summer dessert and I could go for a huge bowl of it right now, despite the fact that I just finished breakfast :). Hope you guys had a great Fourth! The colour of this one is such a beauty, Milena! And it’s so so easy! 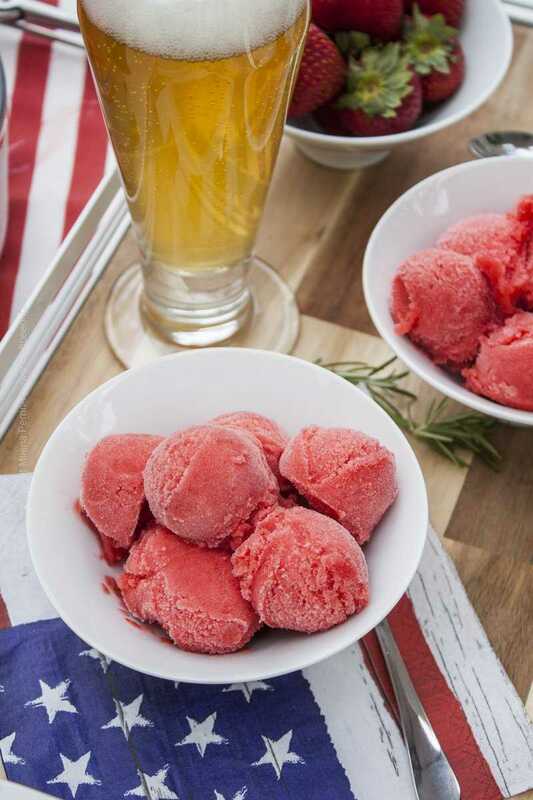 I would never have thought to put beer in sorbet like this, but it totally makes sense…better make sure I leave some for drinking after though 😉 Happy 4th of July to you guys! Have a wonderful day :)!